Tonight I was torn whether to review one of a few beers that my father and I sampled over quite a big session this afternoon into the early evening. Lagunitas is a brewery that I'm somewhat familiar with, I've had quite a few different ales from this brewery but this the standard IPA I haven't had yet so I was quite interested to try it. 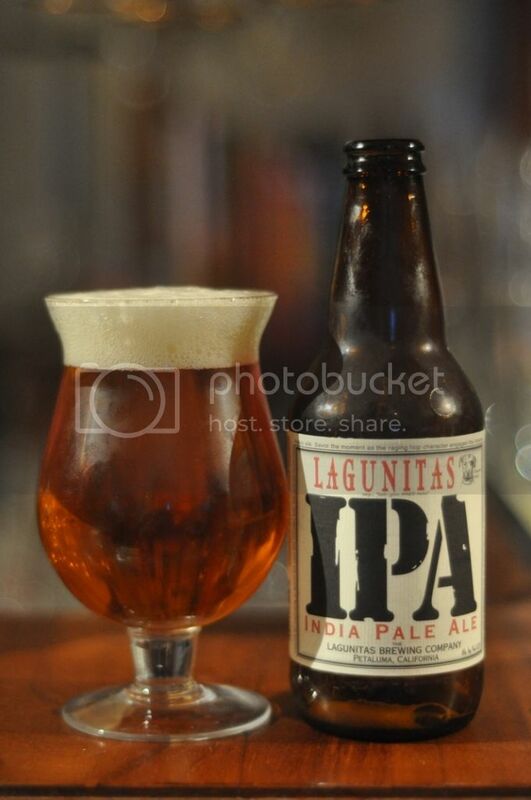 Lagunitas IPA is actually the flagship beer of the brewery and they claim it is a modern twist on an ancient style. Astoundingly this is made with 65 different malts and even more staggeringly 43 different varieties of hops! Those are incredible numbers for any beer, it should make for a really interesting tasting IPA. Lagunitas IPA pours like a stereotypical IPA. It has a beautiful deep golden colour with a 2 and a half finger creamy coloured head on top. There doesn't appear to be a large number amount of carbonation rising to the head, however the retention is top quality and there was at least a finger left at the end the conclusion of drinking and the lacing was impressive as well. The nose of this beer reflects the huge variety of hops that have been used in it's creation. There's citrus hops, floral hops, spicy hops almost every variety of hops you have ever smelt. The most prominent aromas are of grapefruit and pine. This beer's nose is simply incredible and really needs to be smelt to be believed, simply for the nose alone you need to try this beer if you like IPA's. In terms of flavour Lagunitas IPA is actually quite simplistic considering the huge blurb of ingredients included in this beer. Much like the smell the taste is remarkably hop heavy, there is only some minor malt character. I particularly like the combination of some piney hops with some of the floral hops on show in this IPA. The carbonation is mild and the mouthfeel is surprisingly thick for an American IPA. Overall Lagunitas IPA is a really nice IPA, one that strangely doesn't seem anywhere near as complicated as the blurb may make it seem. Despite having huge amounts of different malts and hops it tastes like a normal and quite simplistic IPA. The thing that has to be stressed here is that this is a good thing it is a testament to the brewers that they have been able to blend this huge number of ingredients into a very drinkable product. This is an IPA that I would recommend to all.